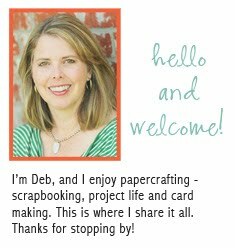 deb duty papercrafting: project life: week ten and a giveaway!! An everyday moment captured - walking Maisy one evening (with a strip of washi tape). And my favorite pocket of this week - a drawing that Mason made while playing around with the Adobe Ideas app on the ipad. He drew a stick person for every member of our family and we're all doing something we love to do. See the camera in my hand? Now for the details of the fabulous giveaway. One person will win everything pictured below. 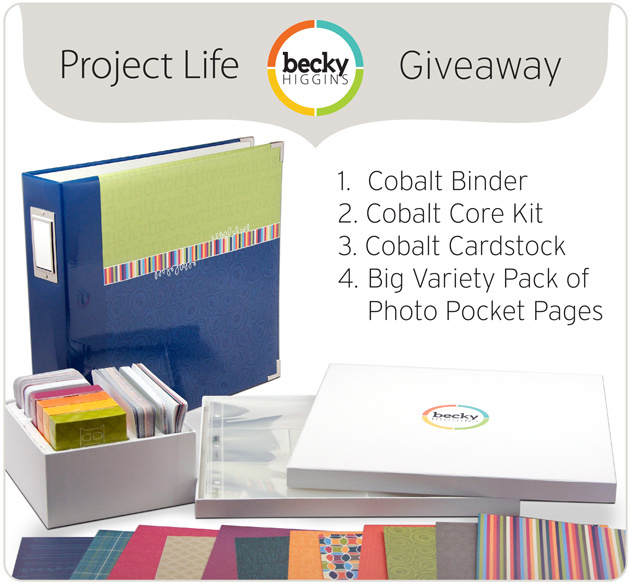 Thanks to Becky Higgins for providing this awesome prize which includes a Project Life Cobalt core kit, a Cobalt binder, a pack of Cobalt cardstock and a big variety pack of photo pocket pages! To enter, just leave a comment on this post (only one comment per person, please). The giveaway will remain open until Thursday evening at 8:00 central. The winner will be randomly chosen and must be a U.S. resident because the items will be shipped directly from amazon.com. Come back Friday morning to see if you've won. If you want more chances to win, visit beckyhiggins.com to see who else is hosting a giveaway this week. Good Luck!! I'm so excited at the chance for the Cobalt kit! I've been doing PL for a few months, and I love how easy it is to create a beautiful album. Thanks for the giveaway! Deb - I love your photos and your style! I also have 2 boys so its great to see how you document their lives. Deb I LOVE that you included the drawing of your family! What a sweet picture! Thanks for sharing your pages this week, and for being excited about PL! I'm gearing up/collecting/wrapping my head around/hoarding for PL 2013!! Thanks for the chance to win! Enjoy following your -PL- blog updates! I truly enjoy the difference of styles design team members and -PL- community members bring to the table. So didn't happen this year. Though I fell behind certain weeks on photos, stories or embellishing our families -PL- my perfectionist wasn't rattled! I had knowledge, techniques and tips techniques I'd learned from this wonderfully honest community I'd put in place by THEIR learning curve... THANK-YOU! I'm so grateful for women like Becky Higgins. Though I'm a beginner... I'm LOVING it and all the experience I continue to learn from this wonderful -PL- network. TFS the opportunity with all! I super love your PL Updates they are always so full of inspiration. I personally would love to win PL for my SIL as she has 3 little boys under 5 and I would love to be able to give her this so she would be able to document my sweet nephews. Thanks so much for the chance. What a wonderful giveaway. Would love the chance to win! I would love to win Project Life!! We are looking to expand our family soon and this would be the perfect way to document this! Thank you for the great giveaway! I'd like to start project life because my memory just keeps getting more and more "lost"! It's so nice to document and look back on life!!! Thanks! Love the look of your pages. This is my second year doing PL and it's neat to see how my pages have evolved over time. I love that Becky has this wonderful Creative Team this year...so much great inspiration!!! Love your pages! I love that Becky has this wonderful Creative Team this year for all of this great inspiration!!!! Thanks to Becky for the giveaway.I am hoping to use the kit for a book about the 5th and 6th graders I teach at church. I want to catch tidbits of their life with God. Would love to win! I just started PL in 2012 and am loving it so far! Thanks for the chance to win a great giveaway. Love how project life looks!! Love your PL album. Awesome Giveaway. Deb, I love your layouts. What a fabulous giveaway! I've been admiring all the PL pieces and in fact, I have everything on my wishlist on Amazon! It's such a neat idea capturing your everyday life that will be forgotten. Thanks for the chance to win! I did a 365 project a few years ago and loved it. I’d love to win the Project Life kit and do it again! I would love to win this for my daughter. She was been wanting to start her own PL. Thanks for the chance to win. Absolutely love Project Life!! Has gotten me back to scrapping on a regular basis, and looking more at the day to day moments that seem to pass us by without even know it! Love that picture that Mason drew! I am already using Project Life for myself but am entering for my mom who is visiting from Singapore. This would be a great set for her to take home with her! Thanks for the opportunity. Thanks for sharing your PL & thanks for the chance to win a kit! I absolutely LOVE Becky Higgins and Project Life!!! Thanks for the chance to win!! I am loving Project Life more and more every week! The drawing from the iPad is so cute!! Thanks for the giveaway opportunity! Anyone who wins Project Life is blessed! Simply wonderful giveaway! Thank you for the chance! I love checking in on your Project Life posts! Thanks for the giveaway! Oh love, is love this for my friend whose having a baby next month! Gorgeous PL pages!!! 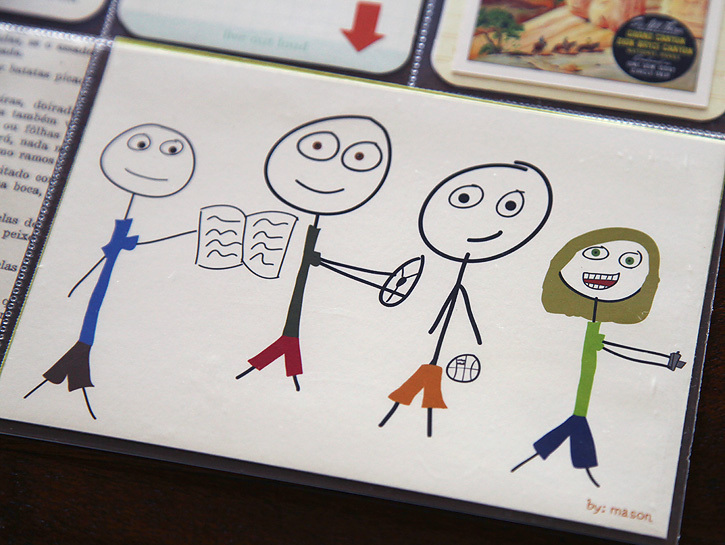 I am so loving Mason's drawing of your family...super cute and a fabulous addition to your page! Thanks for the great opportunity! Your pages are always stunning! Thanks for this chance to win!! Beautiful photography! Always come to this blog for inspiration! I love your pages! 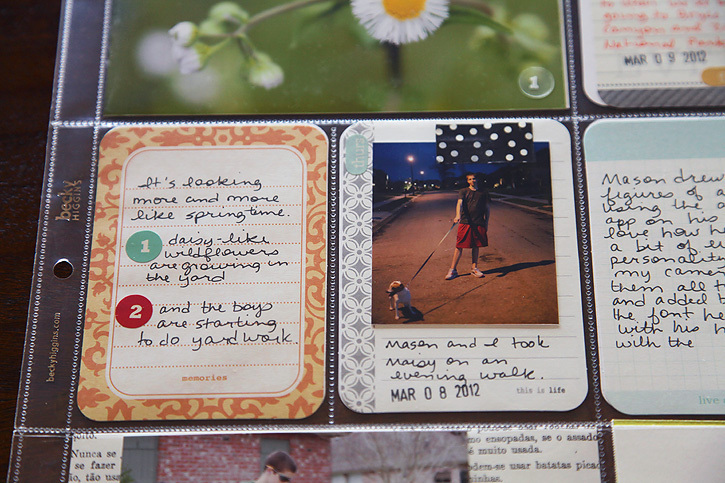 I like how you put pictures on the journaling cards. I've gotta figure out how/where to print small photos! Love these - thanks for the great ideas! So happy this giveaway led me to your blog, I'll be back :) Have my fingers crossed and would be so very delighted to be a lucky winner! Project Life has really changed my life in an awesome way! Great pages and awesome giveaway! I would love a Project Life kit! What a cool giveaway! I would love to win a project life kit. I'd love to have this to do an album for my nephew. The stick figure drawing is brilliant! I am already doing project life, but would love to win and be able to gift my winnings to my sister : ) She is an awesome photographer, and I would be so excited to see what her finished product turned out being. 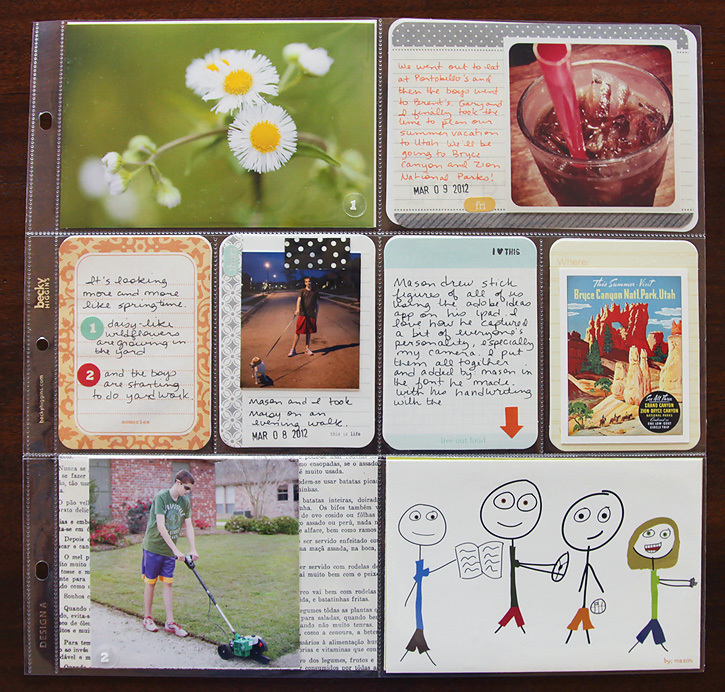 I would love to have a project life kit, i love this new concept of scrapbooking. seems more user friendly. Your PL is awesome! Thank you and Becky for the great giveaway!!! What an awesome giveaway! Loved your pages!! Beautiful! I wish my brother lived closer so the cousins could grow up together! Thank you to you and Becky for a chance to win!! I love Mason's drawing; great way to incorporate it into your PL. Thanks also for the opportunity to win -- the Cobalt set is my favorite! I'm interested in the ease of keeping up with Project Life and would love to get a chance to try it first hand! Thanks for the give away. Glad I am not the only one taking pictures of flowers...although I think mine might be a weed! thanks for the chance to win, i am turning 30 soon and want to use PL to document "year 30"
What fun to see what folks are up too! I love Project Life because it is as quick and easy OR as time-consuming and detailed as you want it to be, and EITHER WAY, it ends up looking good! Great giveaway! I love the way you incorporate your Instagram photos! Thanks for the chance. It's nice to see what others are doing with project life. Love PL! I would love a chance to use the Cobalt kit! Wanted to start this for my newborn, hope I win! I love this concept- would love to win and give it a try! pick me, pretty please!! pick me!! I would love to win this for my son to try. He thinks he could really do this. Thanks for the chance to win some project life products! Your pages are great inspiration. I absolutely LOVE the drawing! What a cool element to include!! Great project life pages! Thanks for sharing! Love your Project Life pages! Thank you for the opportunity to win the Cobalt Kit....this is the one that I am using.....love it! Your pages are great, I love the life you've captured! Thanks for the chance to win. Love your beautiful pages! Thank for a chance to win! love all your pages! I love your fun and colorful pages! This would be really fun to win - I'd love to give PL a try! Thanks! I love your PL pages. Thanks for sharing. I would love to win PL. I need to start documenting the small things in life. Thanks for the chance to win! Thank you for the opportunity! It's turning out great! My oldest will be a senior next year - I want to help him remember his senior year - can't believe it - it was just yesterday that we brought him home from the hospital...and I'd like to use Project Life to do that. i absolutely love project life! Love your PL pages! Thanks for the chance to win! I am doing the Jessica Sprague digital Project Life kit and would love to try the paper product as well! I love PL!!!! This would be a great to have. I'd love to win Project Life! Thank you! To bad :( I live in the Netherlands. Can't enter to win. 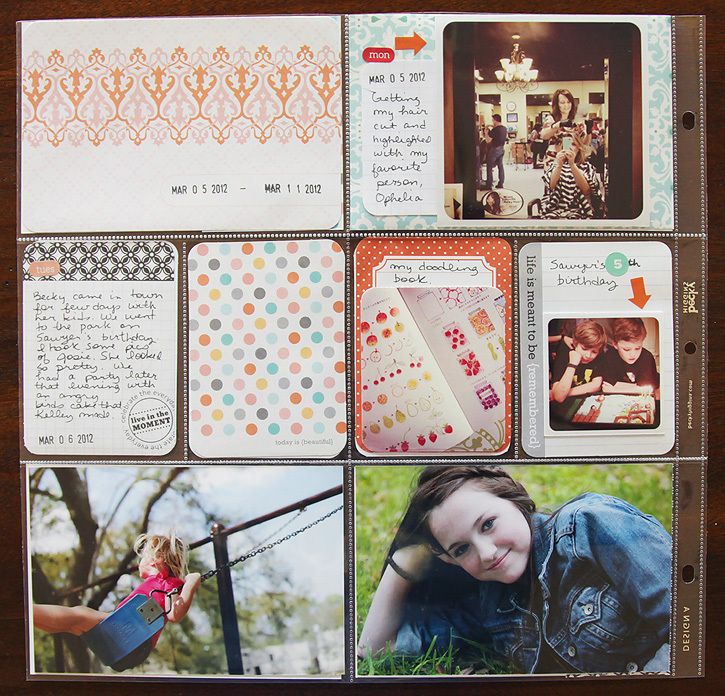 Would die if I would get a free #projectlife kit. I would be so grateful, thank you for the chance. This is fantastic! I just started my PL this year after seeing so much inspiration online. I have read a lot of blogpost about this that helped me to be convinced how important it is to document ordinary memories. I do not have a great memory and can barely remember my childhood. If I can turn back time, how I wish my childhood has been documented. I wanted my daughter to get this opportunity. Wow! Thank you for a chance to win a wonderful prize package! I'm just starting on a Project Life album and was a little bummed that several products I wanted were out of stock. Fantastic giveaway! Starting a Project Life album and could use some goodies! New to your blog. I am a huge fan of Project Life! It looks like it would work perfectly with the way I journalize. Thanks so much for the chance to win the kit! Thanks for the great giveaway! I would love to win a project life kit. LOVE LOVE project life! thanks for the opportunity to win more! I would love to have the chance to win this. I've been wanting do Project Life, but haven't been able to afford to. Thanks for the chance. I would love to try out Project Life. I have only given it as a gift to someone else. I just learned about Project Life from a photography class I'm taking. I'd love to try it. Thanks for the chance to win one. Thanks for the chance to win! I love your son's picture of your family. i love the way you document for PL....thx 4 the chance to win! Love your pages. Thanks for the chance to win. I would LOVE to win this! I've been wanting to start Project Life and this would be the perfect way to begin. Thank you for the chance to win! wow!! count me in. it'd be awesome to win this kit. You have a great plog with wonderful Project Life(and other) ideas. I'm planning to start an album in 3 weeks when I go to Alaska for the summer. I would love to have a new kit to continue on with the project when I return to Alabama. There will be a new grandbaby waiting for me!!! Thanks again for all the great stuff!! I'm loving the Cobalt collection! The colors are so bright and happy! Thanks for the chance to win! I'm in love with the Colbalt kit! Thanks for the chance! I would love to win this Project Life kit! With a 19 month old and a 1 month old I don't have much time to scrapbook anymore. This would help me catch up with pictures and stay current. Thanks for the give away! Thanks for the chance to win Project Life! I can't wait to get started on PL! Thanks for the chance to win! Thanks for this terrific opportunity! Enjoyed seeing your pages!! This is very cool! Thanks for the chance to win!! Love the stick people, they are so cute. Thanks so much for the chance to win. I love your inspirational layouts! Swwweeet giveaway also! Awesome! I also have 2 boys and love to see how others document life without the frills, lace, and pink. Thanks for the great inspiration"
Love this kit! Thanks so much! I love your simple approach to project life! Thanks for the chance to win! We just broke ground today on the house we have been planning to build for 25 years! I would love to be able to use Project Life to document the construction. Love that little drawing you included...I can always use more PL stuff! Love this week's layout! I'm dying to get my hands on some PL stuff! Love it! what a great way to record all those everyday memories! i would love to start my own project life! Love coming to visit your PLs every week. Thanks for a chance to win! Thanks for the chance to win Deb! I would love the opportunity to jump in and start project life this way! I love the idea and need a nudge to get started! I am excited about this giveaway. Great opportunity to begin using this great product. Thanks so much for a chance. Your layouts are darling!!! Would love the cobalt kit! I've seen some of your pages, I love them. I hope I can start Project life. I love this! I have the page protectors and would love the rest of the kit! thank you for the chance to win! I would love to use this to document my life with six little ones! The stick drawing is the BEST!!! New to project life and been waiting so long for new product...end of May seems so far away!! Thanks for this great giveaway! I have sooo wanted to start Project Life! Thanks for the chance to win! What a great chance to get prepped for next year!!! Thanks you for the beautiful pictures of Week 10. I love your style. I also love that pic drawn by your child that you included. I am just learning about Project Life. It interests me very much. I would love to try my hand at using it so to win the Cobalt Project Life would be so SUPER! Thank you! I love the little stick people makes the album so much fun. Wow! Love your picture drawn by your kiddo. So cute! Love Project Life! Thanks for being part of this giveaway! Would love to win! Love all of the little touches you added! Cute ideas! I'd love to win Project Life! Thanks for the chance! Love it all. So inspiring! OMG I would love to win this Project Life Kit!! Thanks so much for offering this great giveaway!! What an amazing giveaway - wow! 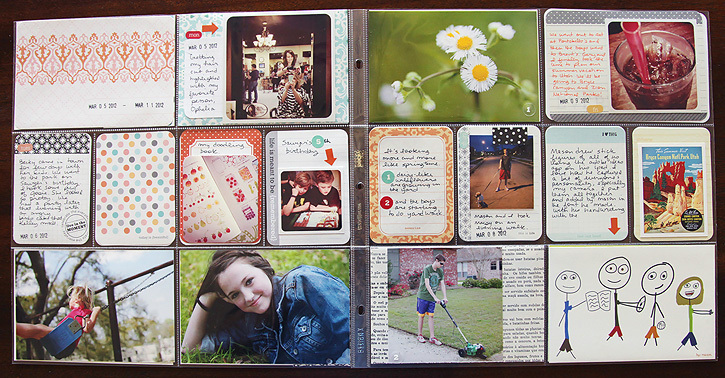 Project Life looks so simple compared to traditional scrapbooking I think I could actually complete a full project. Wish it was available when my son was little. Project life is AWESOME!! Thank you for doing this giveaway. Love the cobalt addition! Thanks for hosting this for one lucky gal! I love Project Life and want to share it.